You are just going to love this Instant Pot Lentil Ham Stew as it super cozy. 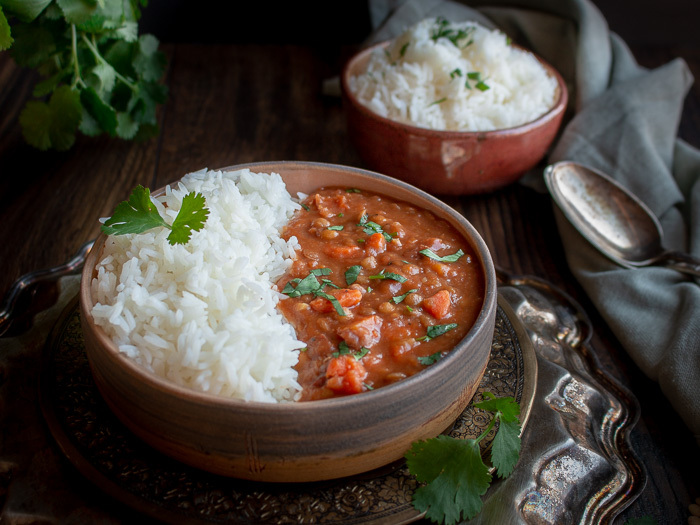 On the first aromatic bite you are going taste the smoky flavor of the ham, aromatics, spices, the zest of the tomatoes and the creaminess of the lentils. We also have stove top and slow cooker recipe directions for you too. The Longer you Wait, the Better it Gets! We have been eating this delicious Lentil Ham Stew for the last 2 days. Honestly, we swear it is getting better each day its flavors have a chance to mingle together. Instant Pot Lentil Ham Stew is a great meal plan for when you want to feed your family healthy nutritional meals but do not have a lot of time to get sorted. It’s a delicious lunch to bring to work or school. When you open your thermos or lunch box, you are going to have 5 of your closest “cube buddies” asking you for a taste. The beauty of this Instant Pot Lentil Ham Stew is that it is a dump and go kind of recipe. That, dear friends, is instrumental so you can get all of your other tasks done at work or around the house. This Instant Pot Lentil Ham Stew has all the flavors of the slow cooked loved stew without all the fuss. Healthy World Magazine’s mascot and clean-up crew (Buddy) is on post op recovery for knee surgery. Buddy is doing well. Feeling sorry for the poor little guy BUT he is driving us crazy with his whining. We can’t get anything done as he wants to be held 24/7. That is exactly why we created this fabulous dump and go recipe. We have been the one-handed cook and photographer….as the other arm always has doggie in tow. We have also been drinking loads of Tranquil Lemon Ginger Tea to calm our nerves and wearing ear plugs. 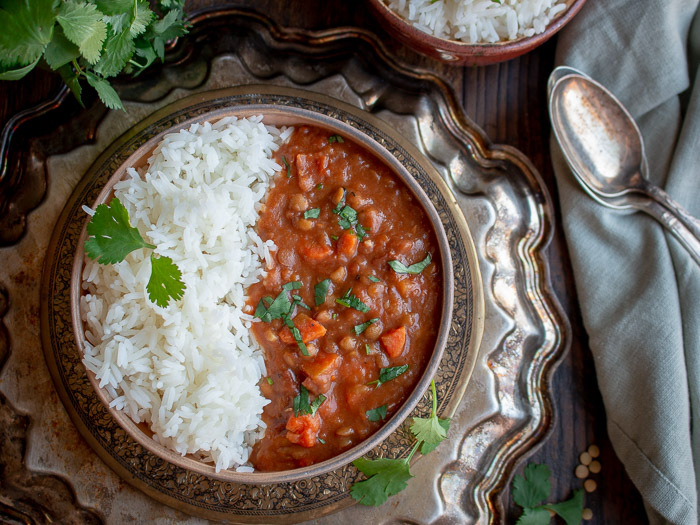 Lentils are small round legumes that are high in protein and fiber and low in fat. A legume is any plant that bears its fruit inside a pod. 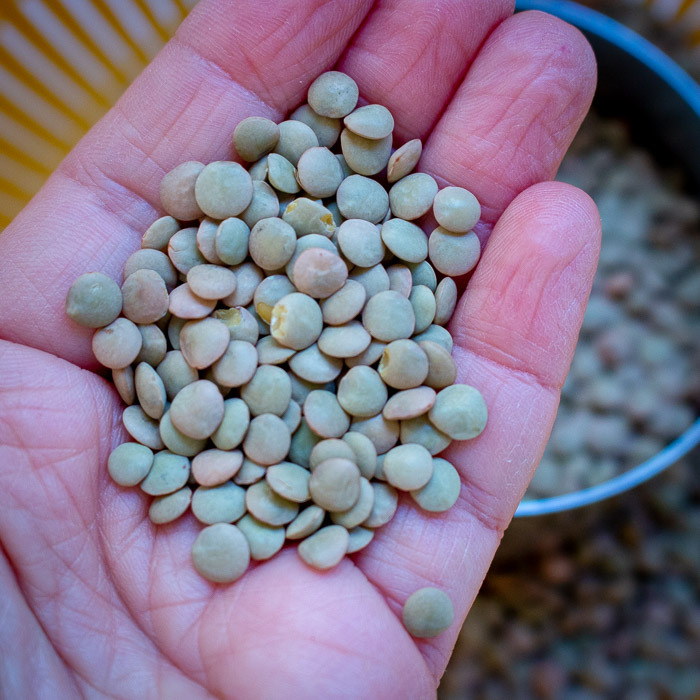 Sometimes, lentils are referred to as pulses. Pulses include beans, lentils, peas, etc. Lentils come in many different colors and characteristics. The most common lentil in the US is either the brown or green lentil. Lentils also come in black, yellow and even red. However, they each have a slightly different cooking time. 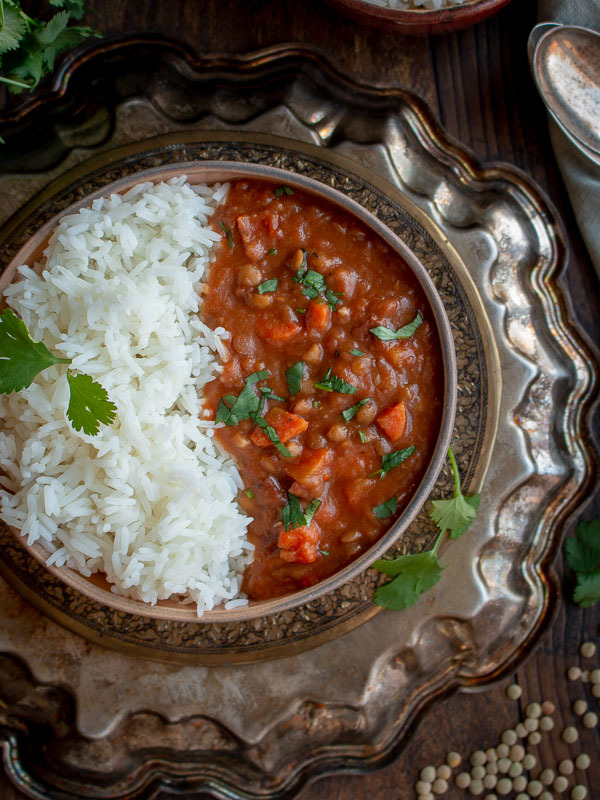 We used brown lentils for this recipe. 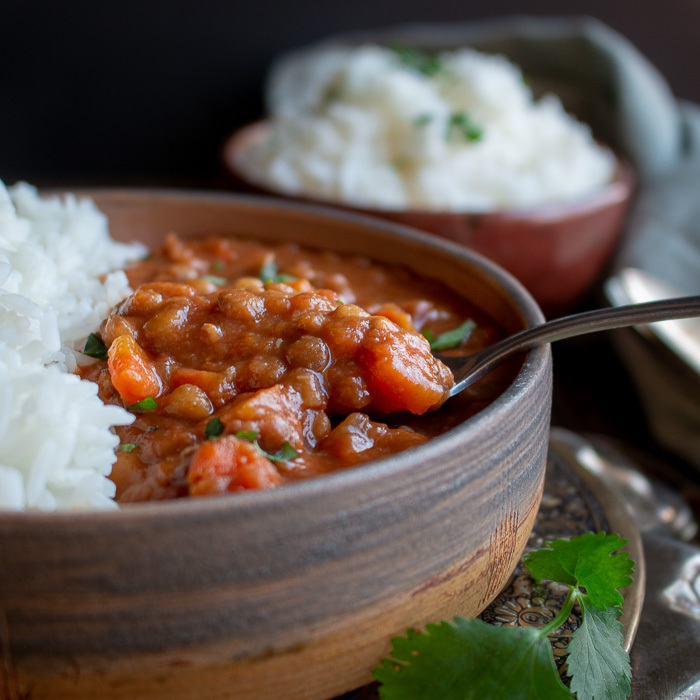 What type of lentils to use in the Stew? You can feel free to use green, brown, black or yellow lentils. However, we do not suggest red lentils as the cooking time is so much less. 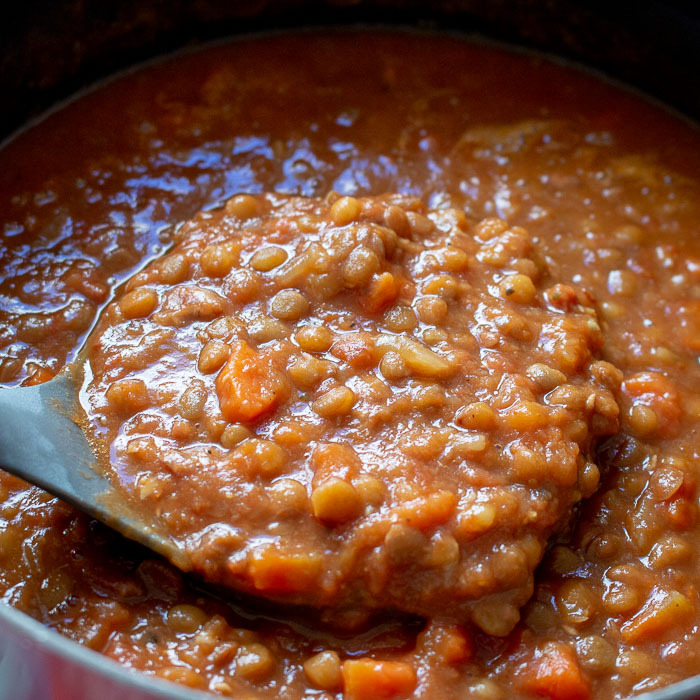 Red lentil may lead to a mushy stew. If you still have ham in the freezer or left over ham, you are going to love our Curried Ham Lentil Soup. How to use the Instant Pot to cook lentils? If you choose to use your instant pot to cook the lentils, we first used the sauté function just to cook the aromatics and vegetables for about 5 minutes. We, then used the high-pressure function on the instant pot. With the addition of all the ingredients and cooked for 15 minutes. Do not use the quick release function as the lentils continue to cook for an additional few minutes while on natural release. Natural release took place around 15-20 minutes later. What can you do with an extra 30 minutes of free time? Do you know what this gave us? 30 minutes of time to get things done, time to exercise, get caught up with work e-mails, finalize that power point presentation, fold the laundry, walk the dog or help your kids with their homework. Adding 30 minutes to your day may not seem like much but for a working parent, this time is worth its weight in gold! You can also choose to make this recipe on the stove top or slow cooker. We will add this information in the recipe notes for you. If you enjoy using your instant pot or slow cooker, you are going to love our 55 MUST TRY Cozy Crockpot Slow Cooker Instant Pot Recipes. Can we make this recipe vegan? You sure can. Just substitute the chicken broth with a vegetable broth and exchange the ham with mushrooms. Also skip the ham broth optional addition. 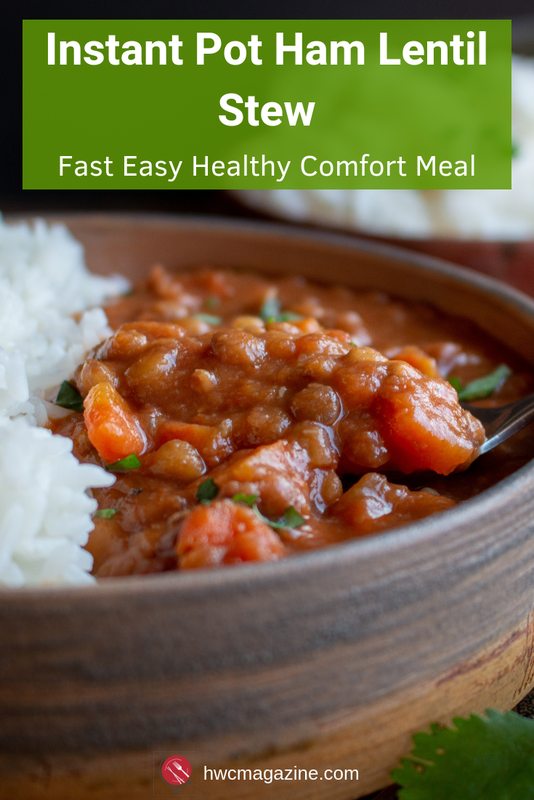 Vegetables make this Instant Pot Lentil Stew extra delicious. The key to a successful lentil stew is to pick firm vegetables that take a bit longer to cook. You also want to cut everything up the same size. Keeping your vegetables uniform in size adds to that silky cozy texture of the stew. We used only carrots and onions as that is what we had in the crisper but celery, parsnips, sweet potato and such would all work very well too. Aromatics and Spices make this Lentil Ham Stew Sing! Bay leaves, garlic, garam masala and salt and pepper are the key ingredients for deliciousness. Garam masala is a spice blend made up of many different ingredients depending on the region. Our Garam Masala was from Kroger’s and part of their “private selection”. The Kroger brand garam masala has a blend of paprika, chilies, spices, salt, turmeric, garlic and saffron. If you cannot obtain garam masala at the store, you can still make this recipe with a few dry spices. You can add ¼ teaspoon dried turmeric, ¼ teaspoon paprika, ¼ teaspoon ground coriander and ¼ teaspoon ground cayenne pepper or chili pepper. We would just omit the saffron as it is expensive spice and with so many other delicious flavors here, you will not miss it. However, if you have saffron at home feel free to add it. Ham bone broth yes or no? Have you ever cooked a bone in spiral sliced ham? Fabulous way to feed a crowd but it comes with loads of leftovers. That is exactly why this Instant Pot Lentil Ham Stew came about. 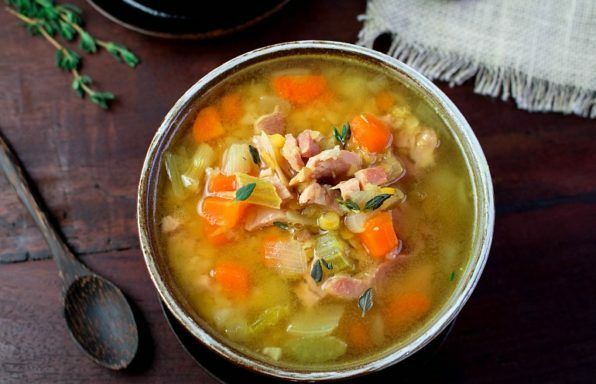 Have you tried our Ham and lentil soup? 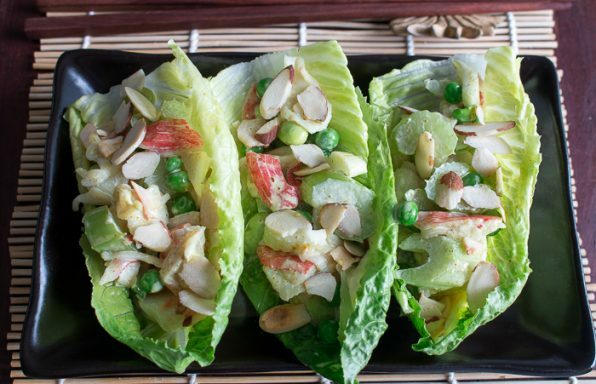 This is also a delicious way to use up those ham leftovers. We have found that Dietz & Watson and Jones Dairy Farm have certified gluten free ham products. When you cook a ham in the oven, you end up with a little ham broth at the bottom of the pan. These little ham drippings are like gold. 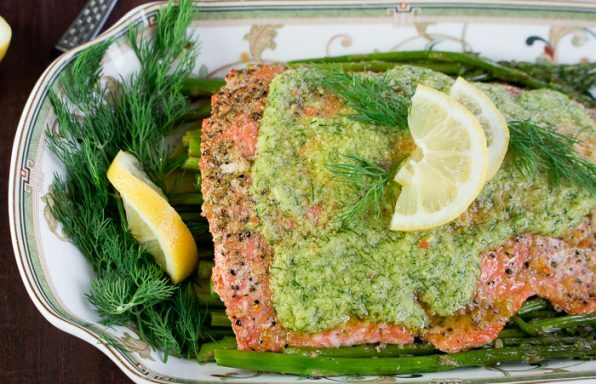 So much flavor packed in just a few tablespoons. It is not mandatory that you add this to your recipe. However, if you happen to be cooking a whole ham do make sure you keep those drippings as they are delicious in soups, stews and such. 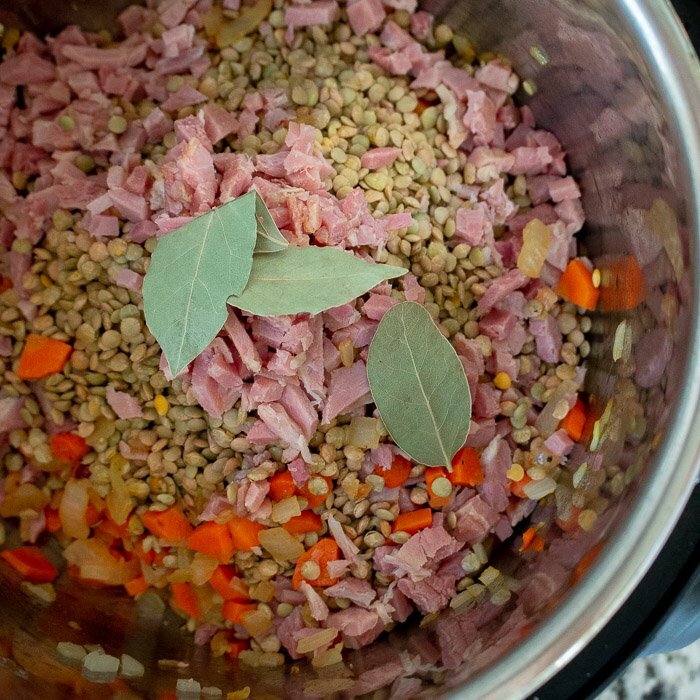 Instant Pot Lentil Ham Stew is going to be your new go to recipe for a quick healthy gluten-free legume comfort meal. 1Set up your instant pot and set to saute. Add olive oil, onion, garlic, ham and carrots and saute for about 5 minutes. 2Add your lentils, chicken or vegetable broth, canned tomatoes, bay leaves, thyme, garam masala, salt and pepper to taste, ham broth and stir. Lock your lid on your instant pot. Set your instant pot to high pressure cook for 15 minutes and switch the steam release handle to SEALING. 3It will take some time for the instant pot to come to temperature maybe up to ½ hour depending on how cold your ingredients were. Allow your instant pot lentil ham stew to cook and allow the natural release of pressure. The lentils will still cook some during the natural release method. 4Once the float valve is in the down position and the instant cooker has released its pressure, carefully open the instant pot lid. Stir your Instant pot Lentil Ham Stew and serve with a side of rice if desired. Garnish with cilantro or parsley, if desired. Enjoy! 1*Feel free to use other hard vegetables of choice like celery, parsnips, sweet potato, etc. If you want to make this recipe vegan, use vegetable broth and hold the ham and ham broth and instead add in some mushrooms. 2*Feel free to use brown or green lentils. Black and yellow lentil may be used but may need to increase the cook time. Red lentils are not optimal as they become too mushy before the rest of the vegetables have a chance to cook in the stew. 3*If you want to make this recipe on the stove top, add all the ingredients as shown above and place on a lid and cook over medium heat until a low boil and then turn down to a simmer and cook for about 30 minutes, stirring occasionally so it does not stick. If your lid is not tight fitting, you may need to add a little extra water along the way to prevent sticking. 4* Slow cooker instructions are to add all the recipe ingredients to your slow cooker and cook on high for 4-5 hours or 10 hours on low heat. 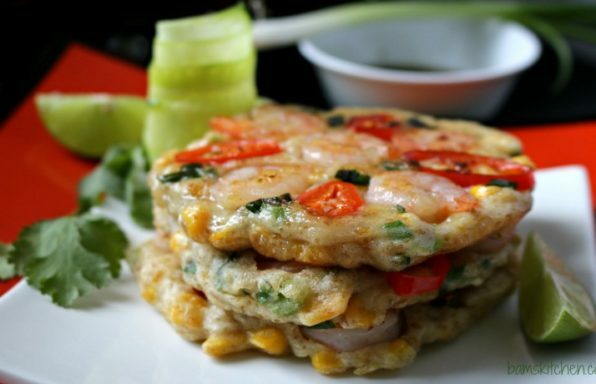 5*Leftovers last for 3 days in the refrigerator or can be frozen for up to 2 months in a sealed container. 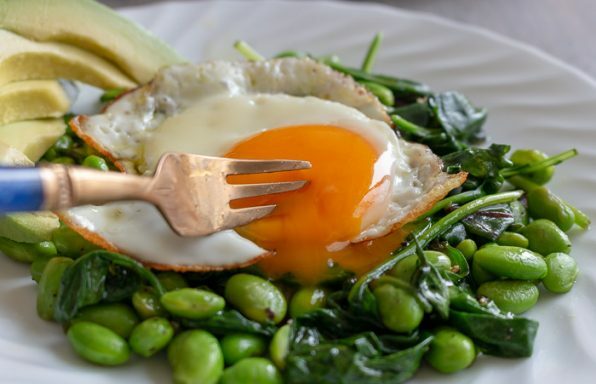 You will need to add a little extra water, vegetable broth or chicken broth when reheating. 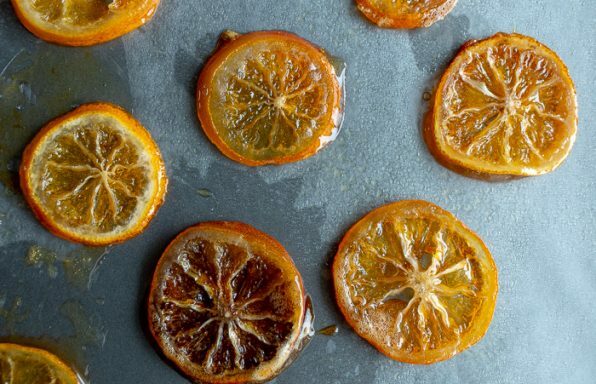 This recipe absorbs some of the liquid as it sits. 6*We have a 6-quart instant pot. Please note that dried beans will double their volume when cooked. There is no need to soak your dried beans but if you do it will speed up the cooking process. It is important to use enough liquid to cover the beans while they are cooking in the instant pot.